In 2018, for the first time in our history (probably), we hosted a ceilidh. There was singing (of course) including guest spots from our lovely friends at Govanhill Voices and Voicemale, and dancing to the music of the Canned Haggis ceilidh band. This was not a fundraiser, but we still managed to make a good donation to our current charity, Refuweegee. So obviously, we're doing it again! The time is 7.45pm (till 12.30am) on Saturday 27 April, the band is Canned Haggis again, and the venue is once more Glasgow University Union on University Avenue. 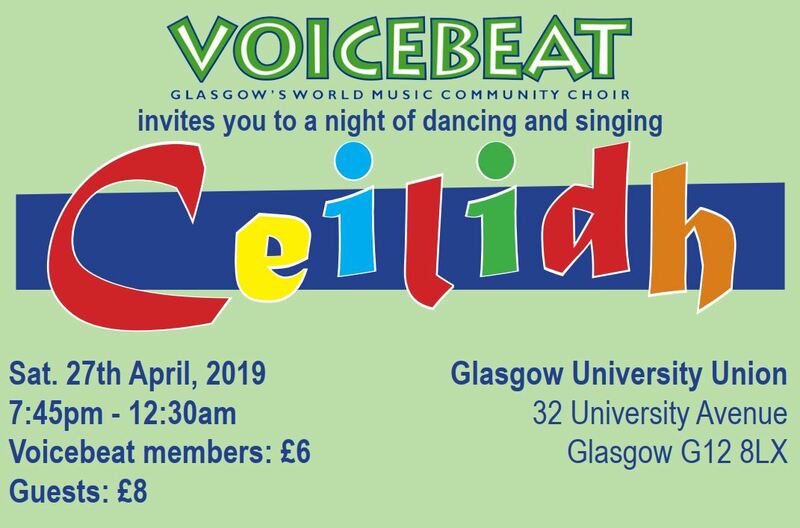 There will be singing from not only Voicebeat but our friends at Govanhill Voices, Voicemale, and Glasgow's newest female a-cappella group, Annorlunda, and opportunities to help fundraise for our current partner charity, the Refugee Survival Trust.